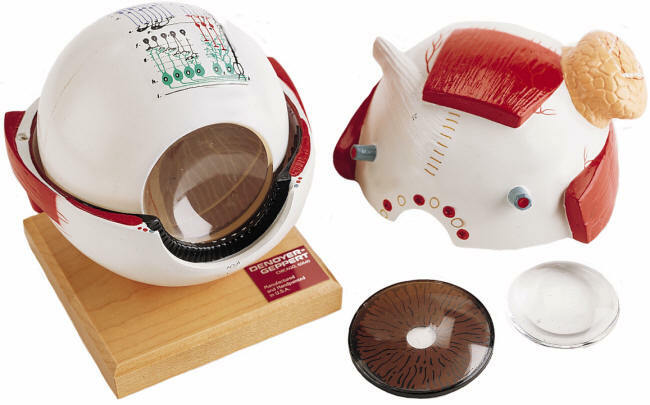 Six times life-size unbreakable vinyl plastic replica of the eye is packed with useful teaching features. On the exterior of the eyeball is the cornea, through which the iris and pupil are visible. The large lacrimal (rear) gland, attachments for all six muscles that move the eyeball, the optic nerve, and surrounding blood vessels. The eyeball divides in half to study the interior. 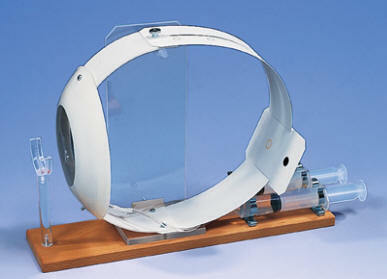 The iris / cornea can be removed as can the functioning Lucite lens, which magnifies and forms inverted images. The transparent vitreous body exposes the choroid coat and retina. Rods, cones and other retinal microstructures are detailed in a highly magnified diagramatic cross section. 42 hand-coded features are identified in the corresponding key. Mounted on a hand-rubbed hardwood base, the model measure 6 x 6 x 6 inches. This is a simplified version of the above. It is still six times life-size and packed with useful features, such as the Lucite lens that magnifies and inverts. 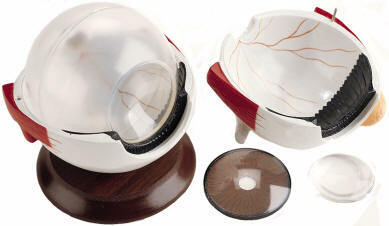 Five detachable parts: the upper hemisphere, the iris/cornea unit, the Lucite Lens, the transparent vitreous body, and the retina. The eyeball disassembles and reassembles with ease so students can effectively learn through hands-on activity. A two-page study guide highlights 19 principal features. 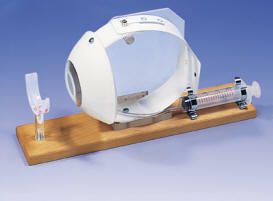 This physical eye model can be used to demonstrate the optical functions of the human eye, e.g. representation of an object on the retina, accommodation (change in the lens curvature), short-sightedness and far-sightedness. 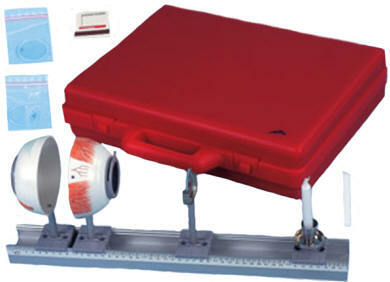 The physical eye model comprises of (1) Half eyeball with adjustable iris diaphragm, lens holder and 2 convex lenses (f = 65 mm and 80mm), on a rod. (2) Half eyeball with retina (transparent screen), on a rod, (3) Lens holder with one concave and one convex corrective lens, on a rod, (4) Candle holder with 2 candles, on a rod, (5) Aluminium rail, 50 cm long, with 4 clamp slides, and (6) Storage case for physical eye model.